In a bid to stop dog poo littering the streets of Limerick, Limerick City and County Councils have enlisted the help of a local business. John Sheahan, Cathaoirleach, Warren Greenaway, Maxi Zoo and The Mayor Kathleen Leddin assist with The ‘Stop Limerick Dog Litter’ campaign. 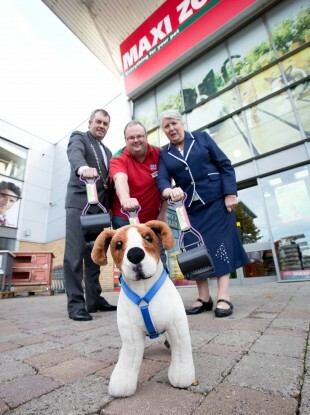 A PET SHOP is to offer the people of Limerick 100 free long-handled pooper-scoopers as part of an effort to fight dog mess in the city and county. The Stop Limerick Dog Litter campaign is a new initiative launched by Limerick City & County Councils. It has already received the backing of the Maxi Zoo pet store on the Ballysimon Road who have donated 100 long-handled pooper-scoopers valued at €3,000 to help local Tidy Towns volunteers clean up areas. According to Mayor of Limerick Kathleen Leddin, the issue needs to be tackled across Limerick. Dog litter causes a significant threat to human health through Toxocariasis, an infection caused by roundworm which lives in the intestines of dogs. This disease can occur when someone accidentally ingests small particles of contaminated soil. Symptoms include abdominal pain, cough, and headache and in extreme cases can result in permanent vision loss. Email “Free pooper-scoopers offered to tackle dog poo in Limerick”. Feedback on “Free pooper-scoopers offered to tackle dog poo in Limerick”.